Sug, awesome!! Simply grand that you too gave bread making a try and am glad you liked it. Suganya...I think me too...thats so beautiful! Su!! Those look incredible!! 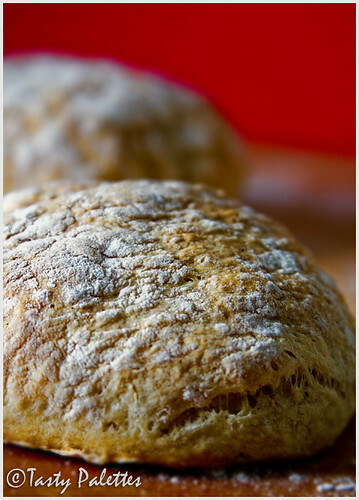 never thought bread looks that beautiful until I saw your pictures!! My bhature comes out different to yours dear and Noel puts on a weird face whenever I serve them, Time to try yours!! wow I just love the pitures...suganya... amazing!! Your dishes are always a feast to the eyes and the tummy. Looks fantastic. Will save the recipe for later. And I surrendered to all of you good bakers. Awesome, just awesome. I just can't bake. Hats to you all who bake so well. I will try your recipe during winter break. I will keep you posted. 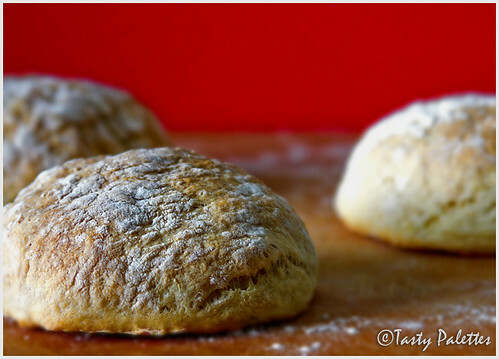 The potatoes lend the bread a softness that is unbelievable. Good idea for the bhaturas. Will keep that in mind next time. now there's no looking back. hoping to see many more breads from you. try naan if you have dough left. i always add potato to naan dough. and rose levy berenbaum has a killer potato pizza dough. I intend on surrendering too *hopefully soon*. It's been just too tempting and I love your addition of yogurt. Will keep that in mind. Your dough looks good, not too sticky. To make bhaturas with them is such a classic idea. Great job Suganya! So glad you liked the kheema S. And thanks for your kind words. drool...early in the morning, I should not look at food blogs, cravings start from now on. Cool idea..and lovely picture. So there you succumbed to the addiction to! Lovely rolls! great pics! I was hoping the bread bug would bite you soon too, love to see your pics! :) And great idea of frying the left over dough! Looks like you worked very hard on this part. Looks yummy. I really want to learn some photoshop skills from you. VegeYum, Thank you. You cannot taste potato in the bread at all. Meeta, I am not a regular baker like you. But I do bake a lot of quick breads. This is my first try at yeast breads :). Srivali, Did you make the bread too? Meera, I didn't set out to bake so far. Bread baking is intimidating. Making quick breads is very easy. You can start from there. You will then be allured to make yeast breads. You said it right, Aparna. Bee, I know. No looking back. I've never added potato to pizza dough. Will try the recipe sometime. Thanks for the idea. Loved your chess-marzipan pic. Brilliant idea. Laavanya, one by one, all of us are falling for it :). Ashwini, Thank you for the recipe. I loved it. First it was Priya of Akshayapatram, then it was you with kara buns (brilliant idea), now its my turn. Shankari, True. Even after lunch, I sometimes feel hungry looking at other blogs. Now you are happy, aren't you Namratha? This will be very easy with a bread machine. Do try Shivapriya. I have been here a lot of times but never left a comment until now..I have tried a lot of ur recipes (muffins, uppadam, mysore rasam and ysy i made ur lemon poppy seeds cookies) and each one of them have been a great hit at my place :)! Ur blog rocks!! Suganya, you NEVER disappoint. If this is not perfection I don't know what is. So glad you've broken the ice, Suganya. 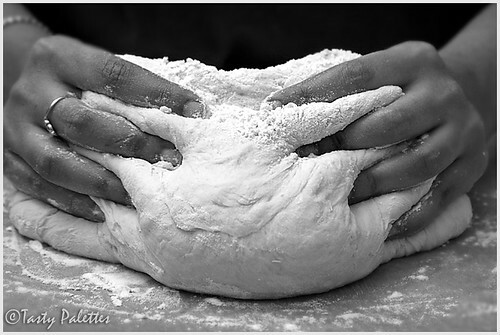 Making bread is really not that complicated; it's more of the "fear factor" that holds people back. Very nice sequential kneading pix going on there. Fry bread! That's what you made! I loved the first pic! And the quadtych is excellent, too! Actually all of them are! 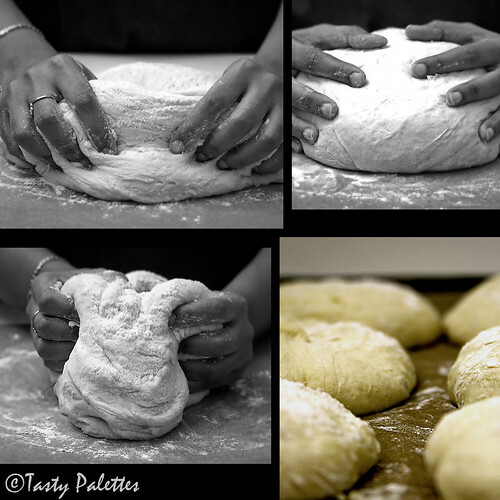 Awesome bread and you have such beautiful hands. I liked the pics in black and white too. Looks delicious Suganya! Pictures look wonderful! Who wouldn't :). The only time i have potato bread is when its home made! Its indeed come out so well! Wish i could get some now :). 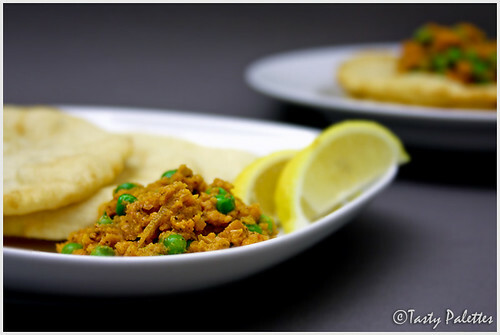 And great idea for making bhaturas with the bread dough, will keep it in mind next time bake a bread :). fantastic !!! nice and beautiful photos. The hands those come up with the best of dishes!...The hands those click the best of pictures!...The hands those serve food with love...The hands those type and blog in..
...the hands those reach out to all with encouragements(but I miss them recently)! i tried the gobi and it was so yummy!